General Contractor: J. E. Dietz & Co.
Building Materials/Description: Stone, $62,500. 1936: John C. Moore repaired the building, remodeled the basement, added offices for county auditor, agriculture agent & home demonstration agent. 1973: Elevator installed. 1988: Williams Co. electrical & mech. renovations. A Richardsonian courthouse strongly influenced by the Allegheny County Courthouse in Pittsburg, Pennsylvania. The raised three-story building is of limestone, cruciform in plan, with a hip roof and heavy towers with pyramidal roofs and dormers flanking the side arms. The front arm of the cross is longer than the others and has an attached one- story porch with Romanesque arches. The windows are tall and narrow of the one-over-one double-hung sash type. Those on the first and second story have stone lintels. The windows on the third story are arched. A two-story arch frames the paired windows of the second and third stories. A segmental arch varies this pattern above the main opening. The three minor entrances are inset in Romanesque arches. A tall central tower has two-story slit-like windows like those in the Richardson building in Pittsburg, with clock faces above, all contained in a tall arch. The top story of the tower has a trabiated open bleeder and is crowned with a four-part pyramidal roof. Lavaca County encompasses an area of approximately 950 square miles. Its land originally was included in grants belonging to Stephen F. Austin and Green C. DeWitt. The Texas Congress created a “judicial” county from fragments of Fayette, Colorado, Jackson, Victoria, and Gonzales counties, naming it Lavaca. 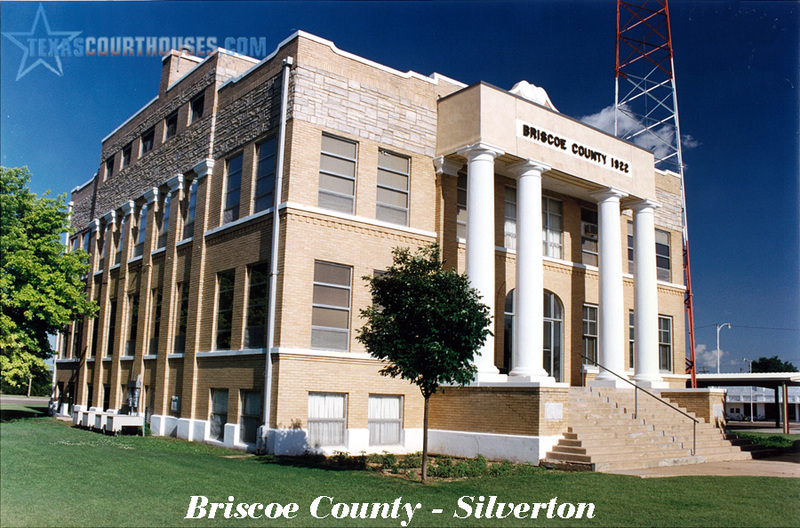 In 1846, Lavaca became a regularly constituted county with 140 taxpayers. From 1846 to 1852, the county seat changed locations several times. The two contenders for the honor were Petersburg and Hallettsville, but Hallettsville became the seat only after two elections and a violent archive war. 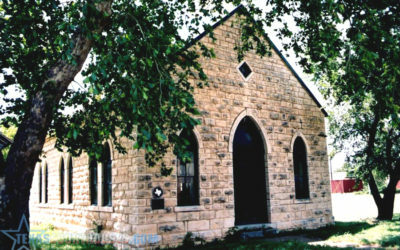 Petersburg was five miles west of Halletsville and grew rapidly when Lavaca County was organized. Without waiting for an election, the town built an $800 courthouse. 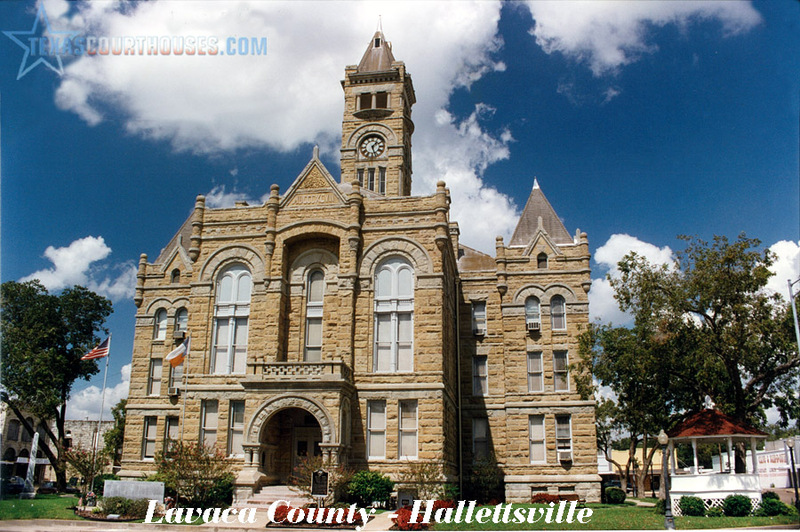 County Commissioners called an election and Hallettsville won. When Petersburg citizens ,burned the returns, the commisioners called another election. Again, Hallettsville won, and again Petersburg refused to give up the county records. Under the direction of Mrs. John Hallett, Hallettsville citizens went to Petersburg and took the records. Until the county built a new courthouse, the commissioners convened in Mrs. Hallet’s home, now the estate of Mr. and Mrs. Dave Finkelstein. About 1852, the Hallets donated a townsite and additional lots to the Commissioner’s Court. The lots were offered for sale to the public and the proceeds were used to erect the permanent buildings of the county. By 1865, the Hallettsville courthouse was in such poor condition and the space it offered so limited, that the court called for the submission of bids for a new building. When the court accepted plans in 1873 the contract went to J. E. Dietz and Co. for a bid of $16,500.00. First materials for the structure arrived January, 1874, and Dietz completed the building in November, 1875. The old courthouse was sold at public auction to Jonathan Speary for $330. The courthouse was repaired in 1894, and a belfry was built on the roof, but March 8, 1897, the County Commissioners, Judge, and Clerk voted to have a new courthouse built. Eugene T. Heiner of Houston as employed as architect, and A. T. Lucas was awarded the contract for the lowest bid of $62,500. W. W. Otten of Houston provided sewers and plumbing for $2,775, and Diebold Safe and Lock Company installed the vaulting for $6,150. Seth Thomas Clock Company was given a contract on November 19, 1898, to build a clock tower for $1,350, and Commissioners Emily Gieptner and Vogt were assigned to arrange the yard and fence for the new courthouse. Finally, the Commissioners Court issued eighty bonds at S1,000 each at an interest rate of 5% to be paid in forty years. Until the commissioners accepted the courthouse May 12, 1899, they rented the opera house from Kahn and Stanzel for $65 and two rooms from D.E. Raab for $8 a month. May, 1936, the County Commissioners employed John C. Moore to make general repairs to the courthouse. They gave J.R. Goode the plumbing contract. Total cost of the repairs was $13,533 and included a remodeling of the basement, and the addition of offices for the county auditor, agriculture agent, and home demonstration agent.